Remodeling a home not only makes it a more pleasant place to live, it may increase the property values. However, certain projects, such as kitchen and bathroom remodeling, provide greater returns than others. 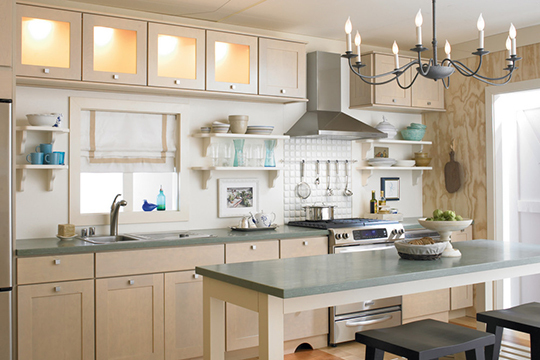 For the highest ROI, kitchen renovations are a sure bet. Below, homeowners will learn several benefits of kitchen remodeling. Kitchen renovations improve the room’s overall function in several ways. For instance, extending cabinetry will provide additional storage space. For those who want to go further, removing the wall between the living room and the kitchen will allow the addition of more counter area. Upgrading lighting fixtures and appliances will make the room more functional as well. Upgrade older appliances to modern, energy-efficient models to decrease the amount of power the kitchen uses. Look for ovens, dishwashers, and refrigerators with the EnergyStar designation, which indicates that they meet or exceed the EPA’s energy efficiency standard. Replacing conventional lights with LEDs can help homeowners cut their energy use. Upgrading the kitchen’s appliances to more efficient models won’t just make the room more environmentally friendly, it will make it more sustainable. Low-flow faucets help to reduce water usage, and recycled cabinets, countertops, and flooring are renewable and sustainable choices. If the kitchen’s design looks like something out of the 1970s, it could probably use an update. Change the room’s entire appearance by repainting the cabinets and walls or by upgrading cabinet hardware. Of course, it’s great to install new floors, countertops, and cabinetry. Kitchen renovations may improve comfort in various ways. For instance, increased ventilation helps reduce the heat and odors during cooking. Adding a kitchen island with seating is a good way to accommodate dinnertime guests, and adding bigger windows will help bring in natural light. Upgrade those old kitchen appliances to reduce the chances of injury related to poor function. Homeowners can also implement principles of universal design. With a wall oven, there’s not as much chance of injury caused by overexertion. Depending on the nature of the kitchen renovation, a homeowner can recoup about 70% of the cost of a kitchen renovation. Not only that, a newly remodeled kitchen is a big draw for potential home buyers. As discussed here, there are numerous benefits to kitchen remodeling, making it one of the most profitable home improvements. Visit the website for more details or call today to schedule a consultation.